According to CNN, FDT will announce his candidacy for President on September 6, just after Labor Day. On Tuesday, Porter and Hedges announced it would raise first and second years to $160k and $170k respectively, but said it will not announce compensation for years 3-8. More curious, however, is the firm’s decision to take billable hours out of the year-end bonus equation. Apparently, associates still must demonstrate merit in some fashion to qualify for a bonus, but the amount is now independent of hours billed. As a going-away gift, Karl Rove’s fellow West Wingers saran-wrapped his car, and plastered it with sticky notes and a “I [heart] Obama” bumper sticker. Almost as good as the “w” keyboard prank pulled by departing Clinton staffers. This is why I continue to really like Lance (above and beyond my obligatory allegiance due to our shared Texan heritage). 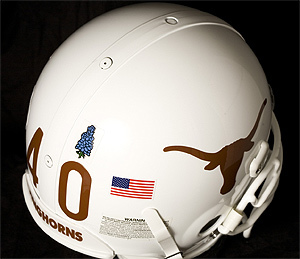 The Longhorns will don bluebonnets on their helmets this year to honor the passing of Lady Bird Johnson. While I’m generally against the concept of putting flower decals on football helmets, here, it is not only quintessentially Texan (for you out-of-staters, the bluebonnet is our state flower) but entirely appropriate in light of Lady Bird’s tireless efforts to beautify our Great State. I can imagine few better ways to honor one of Texas’ favorite daughters than by having our state’s greatest football team honor her memory.